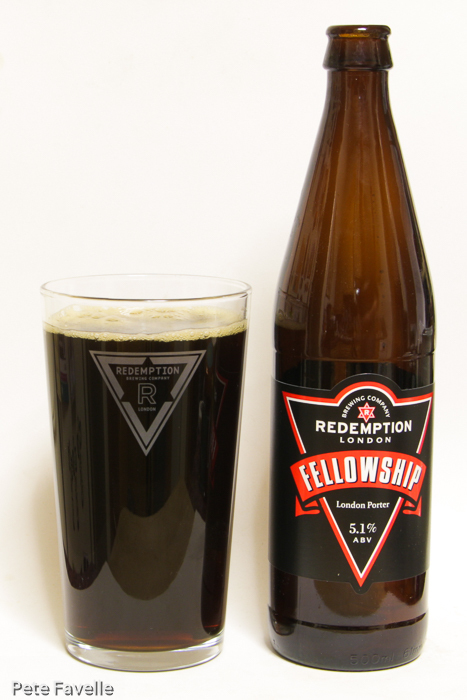 I’ve always been a big fan of Redemption‘s beers, so it’s with great pleasure that I’ve been watching the progress of their new brewery – moving to much larger premises any day now, which can only possibly mean more fantastic beer. I’m also delighted to have a rare opportunity to use an appropriate branded glass! Fellowship Porter is a 5.1% ABV dark brown porter, with a fairly fleeting tan head. The nose is full of toasty aromas; darkly roasted grains, touches of spent coffee grounds and a little hint of blackcurrants. In the mouth there’s a light initial sweetness quickly swept away by a bold but not aggressive bitterness. More dark grains, a background of sharp blackcurrant juice, and just a suggestion of bitter coffee. The finish is dry, with quite a significant hoppy bitterness that lingers well after everything else. It’s light bodied – for me, one of the things that separates porters from stouts – and just plain delicious. It remains a style-defining classic in my mind, and still deserves it’s 4.5 stars.